The principal of a Magnet train is that floats on a magnetic field and is propelled by a linear induction motor. They follow guidance tracks with magnets. 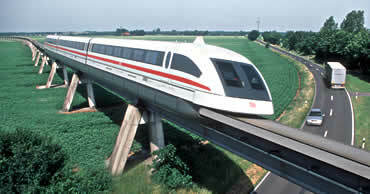 These trains are often refered to as Magnetically Levitated trains which is abbreviated to MagLev. The maglev trains can travel at very high speeds with reasonable energy consumption and noise levels (systems have been proposed that operate at up to 650 kilometres/hour (404 miles/hour), which is far faster than is practical with conventional rail transport). The world's fastest passenger train made its first public appearance on December 2001 in Shanghai, accelerating smoothly to 267mph . before jamming on the brakes so that it would not run out of track. The Transrapid 08 transport travellers between Pudong International Airport and Shanghai's financial district, a distance of 30 kilometres. It will cover this route in just seven minutes.